a further two years today, meaning he will wear the red and green until at least the end of the 2015 season. under 20s Grand Final against the New Zealand Warriors. 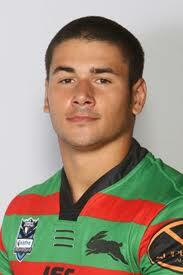 important member of the Rabbitohs forward pack over the past three seasons. Rabbitohs Head Coach Michael Maguire is very happy to see Peats commit to the Club for a further two seasons. contract after all of the hard work he has put in over the past two years,” Coach Maguire said. following in his father’s footsteps, Geordi Peats. Peats is excited about remaining a Rabbitoh. “It’s great to be staying here at Souths for another two years,” Peats said. “I’m a South Sydney junior and never wanted to play anywhere else.